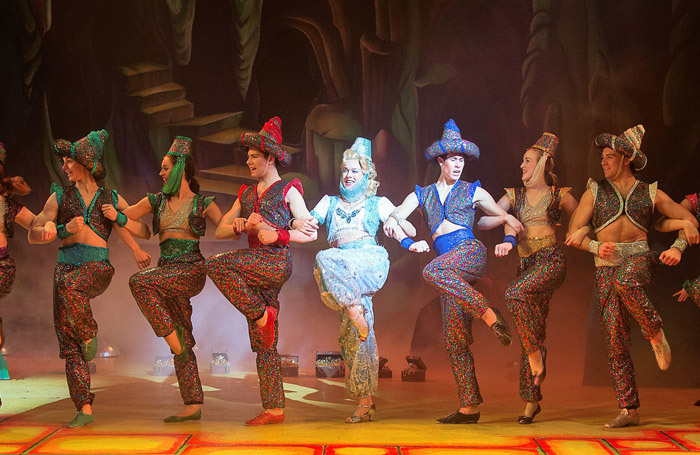 While Disney’s Aladdin plays to packed houses in the West End, Guildford offers its very own take on the pantomime version of the Arabian Nights tale. Some traditional conventions flourish here, notably Emma Thornett upholding the role of principal boy and playing Aladdin with an effective mix of charm and chutzpah. Together with Jamie Brook’s comic Wishee Washee and Peter Gordon’s gruff Widow Twankey, they make a strong dysfunctional family unit, which in turn grounds this rags to riches story. Janie Dee as the Genie of the Lamp seems a peculiar misplacement of resources as Jamie Smith’s script provides little for the award-winning actor to do. Dee does pull off a few slight-of-hand magic tricks but blink and you’ll miss them. At least Rachel Knowles’ feisty Slave of the Ring gets some great gags at the expense of the north-south divide. Undoubtedly the biggest laughs of this show come via the lightening wit of Kit Hesketh-Harvey as Abanazar. Hesketh-Harvey is unrelentingly louche as pantomime’s favourite uncle and his exploitation of an individual audience member is both clever and funny. There are some terrific effects including the ubiquitous flying carpet sequence, two Chinese dragons and an elephant for Aladdin’s triumphant return to Peking. Jamie Attle’s costumes are less successful however, providing the glitter when necessary but lacking variety or invention.